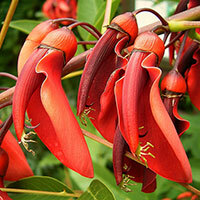 Featured Plants are in alphabetical order by Botanical Names. 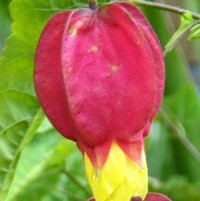 Abutilon has been grown since Victorian days as a sunny parlor, porch or garden plant. 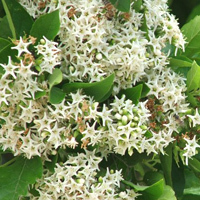 It is a tender shrub 25 degree minimum and produces flowers all year if kept warm. Will do well inside in a bright sunny window out on the patio as a potted plant. Grows 4 to 6 feet tall. Pinch back for compactness. Summer bloomer, this hardy African Violet relative will naturalize and return each year to bring some tropical foliage and color to your garden. Easy to grow, provide bright shade, good organic soil, and plenty of moisture. 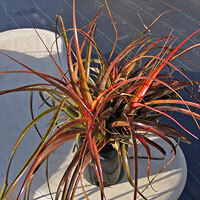 A hardy clumping bromeliad with rich red leaves. 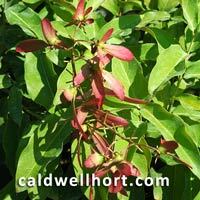 Happy as a terrestrial grown plant, blooms in spring with red clusters of berry like flowers. 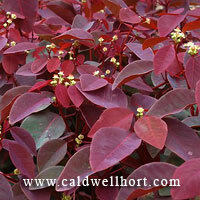 Easy to grow, coloration is best in full sun to light shade. Water regularly, grow in loose organic soil. Nice tropical accent to a patio garden. 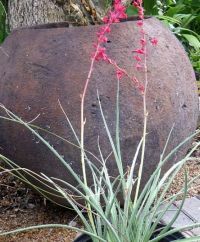 A succulent perfect for rock gardens, containers and desert plantings. Full sun, drought tolerant. 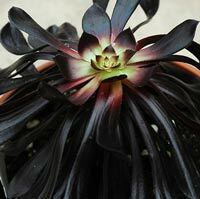 A striking plant with a terminal rosette of almost black leaves and yellow starshaped flowers. Deep dark blue purple globes of flowers on 4 foot stems! Three foot vigorous strap like leaves grow well in full sun. Blooms in mid-summer, several weeks later than regular Agapanthus. 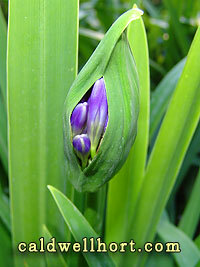 Photo is of flower in bud stage. Full sun, gray green foliage is fragrant, flowers pink and purple are edible. Humming bird attractor, prolific bloomer. Perennial, vigorous and trouble free plant. Great border plant - perennial 1½ feet tall from Japan. 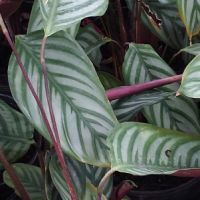 Has silver scalloped leaves. Yellow button blooms in fall. Prefers full sun. Easy, multiplies readily. Shear foliage after blooming to encourage fresh growth. Very showy! 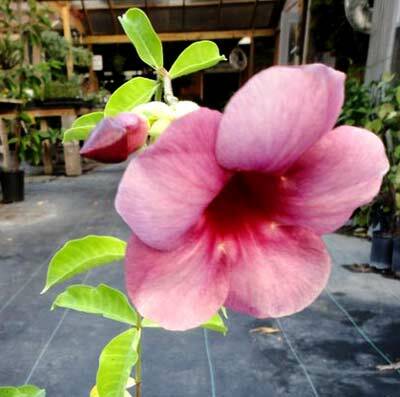 New color, broad leaf evergreen tropical vine flowers most prolifically in full sun. Keep soil moist. Flower scent may be described as delicate and fruity. This is a frost sensitive vine so protect from freezing weather. 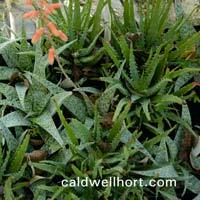 Aloes: Named varieties. Great for rock garden. Neat miniature varieties. Succulents: Unique assortment - great for dish gardens, troughs, rock gardens, xeric plantings. 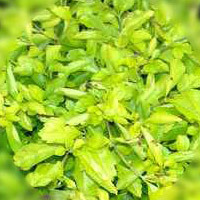 Aromatic lemon-scented leaves are used in herbal teas, as a garnish, and in cooking. Dried leaves retain their scent and flavor well. Grow in well drained soil in full sun. Wonderfully fragrant flowers! When in bloom its wonderful fragrance will fill your garden day and night. 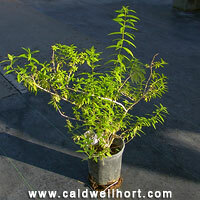 Sweet Almond Verbena is native to Argentina and grows to about 10 feet tall. 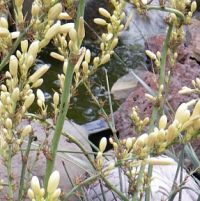 It blooms throughout the summer and fall with with repeated flushes of thin clusters of white flowers attractive to butterflies. Sweet Almond is easy to grow, likes full sun and is draught tolerant after becoming established. This unusual Parrot Plant is topped with brilliant white tiny leaves. Grows to about 12 to 18 inches tall. Prefers full sun to partial shade. Outstanding hardy, drought tolerant native. Great for attracting hummingbirds. Sun to Partial Shade. fresh batch just in! Ground cover pipevine, likes full sun. Attracts butterflies (food plant for Pipevine Swallowtail) Beautiful veined leaves and exotic flower that mimics butterfly larvae. Easy to grow perennial also will reseed itself. 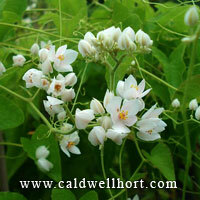 Large vine with heart shaped leaves and huge cream colored reticulated flowers each with its own tail! Flowers are an impressive 10 inches wide. 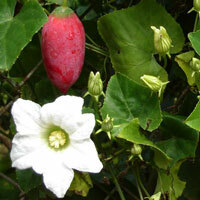 This vine is native to Central America. 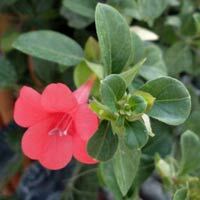 Evergreen shrub that is drought tolerant. The foliage repels insects. Used in Mexican culture, tea made from the leaves is used for stomach ailments. 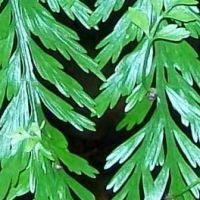 Evergreen, beautiful featherlike fronds, has arching growth habit, easy to grow. Native to India, Malaysia and parts of Africa. 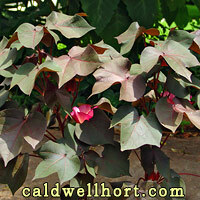 Prefers moist soil, filtered sun to partial shade, plenty of compost, and protect from frost. 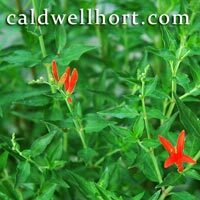 Easy to grow spreading ground cover to 18 inches tall. Also great for hanging baskets. Blooms profusely throughout the growing season. Note: We also carry A YELLOW flowering form, same price! Evergreen groundcover. 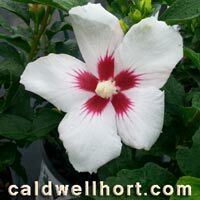 Fantastic hardy full sun borders, salt tolerant, drought tolerant, blooms until frost, easty to grow, will tolerate mild freezes, 1 and half foot tall. Climbing Spinach is a fast-growing, soft-stemmed vine,with thick, semi-succulent, heart-shaped leaves with a mild flavor. A small red flowering 'Orchid Tree' from South Africa. Flowers summer to fall and is hardy in zone 9 if protected for first 3 years from hard freezes. The nature of this small tree is to clamber through brush with long branches, but can easily be kept in a tree shape with some trimming. Grow in full sun, water regularly, protect from hard freezes. Bonfire is an incredibly beautiful tuberous begonia native to South America. 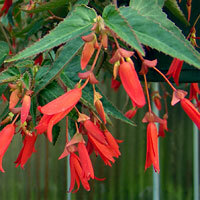 As a hanging basket plant it will produce hundreds of fiery scarlet-orange flowers all summer long. 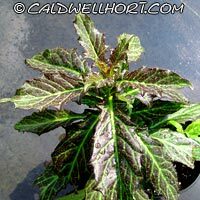 This is an easy to grow Begonia, keep the soil moist and grow in full sun to partial shade. Bound to be one of the best new plants in your garden this year. A Must Have, hard to find plant ! 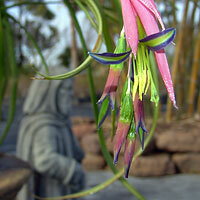 An easy to grow Bromeliad, works well as a terrestrial garden plant. Provide plenty of loose loamy soil and organic matter. Keep cups washed out regularly especially under Live Oak trees. Flowering is usually in spring. Clumps multiply and may be divided each year or two. The darkest purple Bougainvillea, even darker than Royal Purple Bougainvillea! 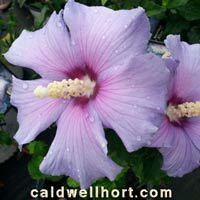 Annual growing 10-12 inches high x 12-14 inches wide, grow in full sun. Great for landscape or in containers. White tubular fluted flowers are heavenly fragrant at night. Prefers part shade. 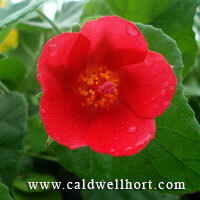 Has been in bloom in my greenhouse Oct. through Feb. One of my favorite plants! Rounded evergreen shrub to 4-5' tall and wide. Orange marble-sized flowers and gray foliage. Attracts butterflies. Endemic to Australia. Rounded evergreen desert shrub 5 to 6 feet tall and wide. Full sun. Yellow flowers in spring and summer. Host plant for sulphur butterflies. 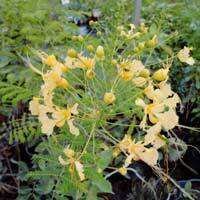 Texas native, full sun, 6 to 8 feet, hardy, blooms summer and winter with orchid-like yellow flowers. Food plant for the yellow sulphur butterflies. Easy to grow. Also attracts honey bees and birds. 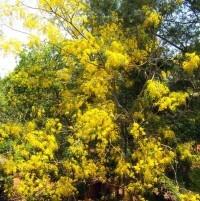 Tropical flowering, deciduous tree with golden chains of yellow flowers hanging from branches, also has large leaflets. 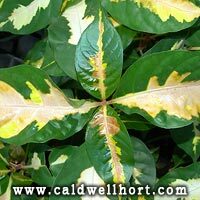 Disease resistant hybrid 'Vinca 'Nirvana' thrives in our summer heat and dry conditions, so be sure to plant in a well drained soil mix. A naturally occurring white form of of the usually purple-pink American Beautyberry. 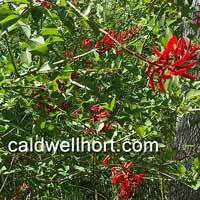 This native Texas deciduous shrub grows 4 to 6 feet tall and wide. Plants come true from seeds. Birds and other wildlife are quite fond of the berries and can strip the plant bare of fruit in a few days foraging. 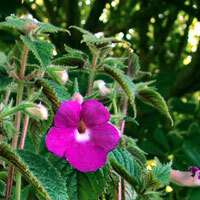 This easy to grow native likes semi-shade but can grow in full sun with regular watering. Beautiful purple-blue and gold flowers about one inch across, leaves light gray green in color. Monarch butterfly plant, conversation piece for any garden. Prefers full sun and regular watering. Native to India. Drought tolerant, full sun, hardy. 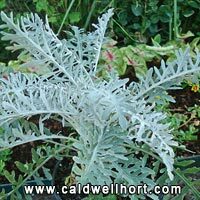 A giant version of Dusty Miller grows 3 to4' and blooms beautiful blue purple thistle like blooms. Needs sun and good drainage. Mexican Redbud is a moderate to rapid-grower when young, reaching a height of 18 to 25 feet. 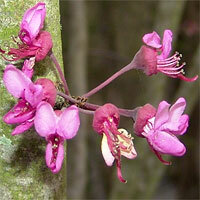 The splendid purple-pink flowers appear all over the tree in spring, just before the leaves emerge. Leaves are considerably smaller than those on Texas Redbud and Eastern Redbud, and the edges are distinctly undulating. 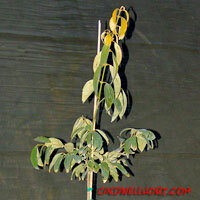 Mexican Redbud has an irregular growth habit when young but forms a graceful flat-topped vase-shape as it gets older. The tree usually branches low on the trunk, and if left intact forms a graceful multi-trunked habit. 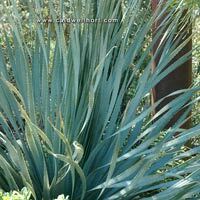 Grow this drought and heat tolerant plant in full sun. Grows 8-14 inches tall and wide. Great for landscaping or container growing. Butterfly attractor. Native Texas perennial wildflower from the Edwards Plateau of Central Texas. 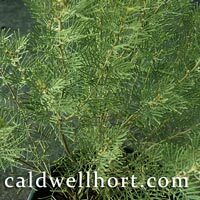 Drought tolerant, 1 to 2 feet tall evergreen plant with aromatic foliage and bright yellow flowers. Recently introduced small broadleaf evergreen tree to 40 ft with shiny tropical looking leaves, appears to be quite hardy in East Texas gardens and is definitely hardier than its close relative, the more tropical Camphor Tree - Cinnamomum camphora. 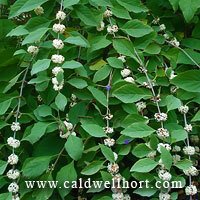 Bluebill is a Texas native herbaceous perennial vine climbing to 10 feet. Prefers shady moist conditions but is also drought tolerant during dry spells. Long stem deep magenta to purple flowers are fragrant. 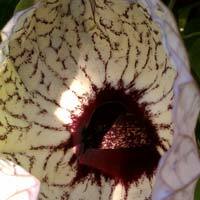 Technically, there are no petals in the flowers--the four showy structures are sepals. Sweetly scented flowers. Hybrid of the native Texas Clematis growing to 9 feet tall and 2 feet wide. Clematis texensis itself is native only on the Edwards Plateau area of Central Texas where it grows along streams and bottomlands. Tolerant of alkaline soils and prefers sunny to lightly shaded conditions with well drained soil. Fragrant rose-pink flowers appear in spring and summer. 'Gravetye Beauty' is an interspecific hybrid with up-facing 3 inch rich ruby-red flowers. 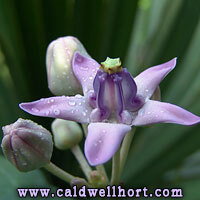 Common Name: Clerodendrum "Musical Notes"
The unopened flower buds of this unusual Clerodendrum resemble musical notes! Blooms almost continually during summer months. 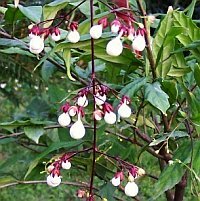 Common Name: Clerodendrum "Light Bulbs"
Upright shrub produces cascades of white buds shaped like small light bulbs, opening to white flowers. Tropical short day bloomer! This vining plant is native to India and is a popular traditional vegetable. 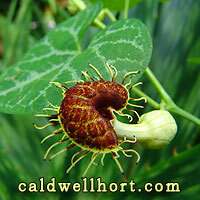 It is quite rare to find in the U.S.	Easy to grow, the fruits resemble little cucumbers and are eaten raw, sauteed, or pickled. 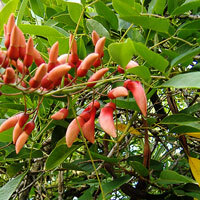 It has medicinal properties as well and is said to regulate blood sugar. It is sometimes recommended for diabetics for this reason. In India it is eaten green when it is crunchy but if you let it ripen to orange it gets soft and is quite sweet. 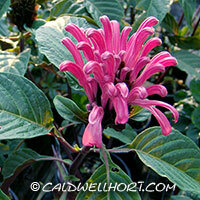 Fun and easy to grow, but protect from winter by taking late fall cuttings to replant in spring. Our stock are from a sterile strain bred to taste better and will not seed out everywhere.It must be grown from cuttings. 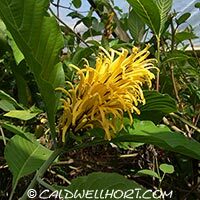 Large tropical vine with brushlike combs of yellow and orange blooms. 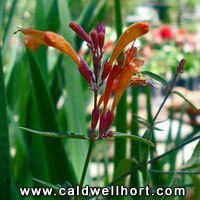 Easy to grow, hardy, colorful burnt orange flowers with red centers on 3 foot stalks. Blooms in mid to late summer. Grow in full sun in well drained soil. 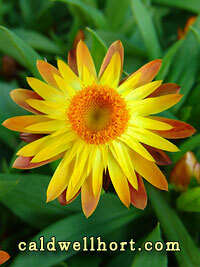 Full Sun to partial sun with medium watering will insure blooms all through June - August. 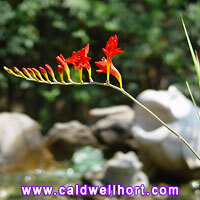 Bright scarlet red flowers on 2-4 foot stems. We also have a yellow form available. 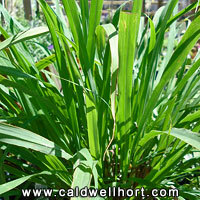 Lemongrass is an easy to grow clumping tropical grass used extensively in Thai and Vietnamese cuisine. Lemongrass is believed by many to be an herbal remedy, helping with stomach problems, arthritis, and containing anti-oxidants. A deliciously relaxing tea is also made from the leaves. 'Gold Stripe' Dianella is a dramatic accent or potted perennial for your shade garden. Sprays of sky blue flowers are followed by persistent turquoise berries in the fall. Carefree maintenance, prefers shade and moist soil. Will grow two feet tall and wide. 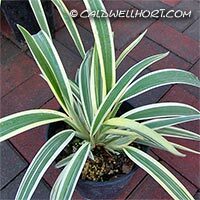 A variegated evergreen perennial 2-3 ft tall with small blue flowers in spring. Later in the fall metallic blue berries mature giving an interesting accent to fall and winter gardens. 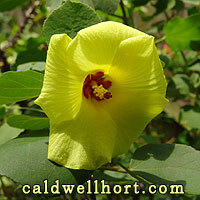 Small tropical shrub from Jamaica grows 8 to 12 inches tall, takes the heat and humidity of Texas gardens. Good lasting chartreuse color for mixed containers, baskets, and borders, grow in full sun to partial shade. Has small blue flowers followed by occasional clusters of non-edible golden berries. A YELLOW-ORANGE coneflower to 6 inches across! 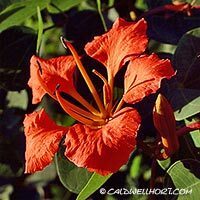 Vibrant orange petals surrounding a dark orange cone on stems up to 3 feet tall. 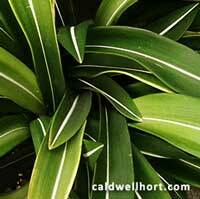 Full sun, fast growing, clump-forming perennial. 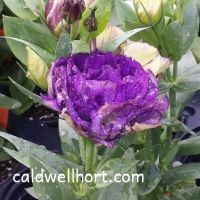 Great cut flower, blooms all summer. Deer resistant and drought tolerant. Fragrant and attracts butterflies too! Echinacea Hybrid - Midnight™ - Fragrant, dark magenta purple flowers and a black-red cone, compact plant. 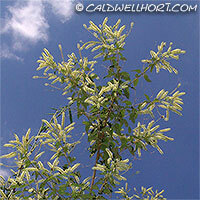 Anacua is an attractive tree mainly native to South Texas but can be found as far north as Austin. 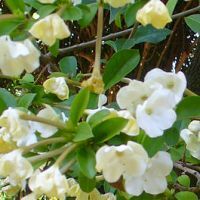 It blooms from spring through summer with white, fragrant flowers that cover the tree in dense clusters. Bright orange fruits then ripen from April to June. Its name 'Sand Paper Tree' comes from to the rough texture of its leaves. Blooms clusters of frilly white petticoat like flowers that are fragrant at night and smell of coconut. Flowering tree native to South America. Can grow to 15' but can be pruned to shrub size. Blooms beautiful butterfly shaped red flowers from April to October. Flowers are rich in nectar and are a favorite for hummingbirds. Easy to grow and quite hardy. Note all parts are poisonous. 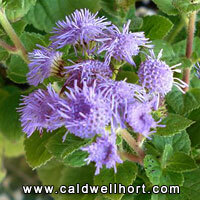 Blue-mist Flower is native to the central and Southeastern US. Its bright blue flowers are butterfly magnets! 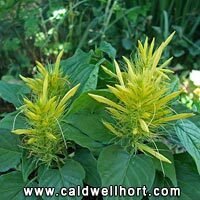 Easy to grow, this herbaceous perennial likes full sun to partial shade with medium wet consistently moist soil and will readily naturalize in the garden. 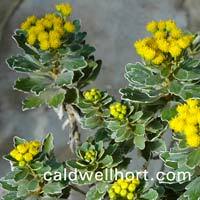 Works well as both a groundcover or filler plant. Blooming is best in summer and early fall. A Crown-of-Thorns without the thorns! 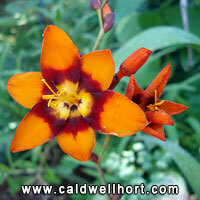 This beautiful plant blooms all summer with bright red flowers in pairs with yellow centers. 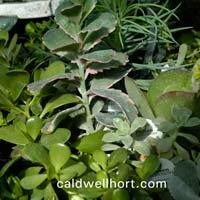 It is a semi-succulent shrub from Madagascar and can tolerate moisture better than most Euphorbias. Excellent potted plant, protect from freezing weather. Favorite of hummingbirds. Partial sun to bright shade. Info: In the Poinsettia family, this succulent is winter hardy. Tricolor foliage turns burgundy in fall. Very pretty new plant! Info: Annual. Double purple, double pink, double yellow. Good cut flower. 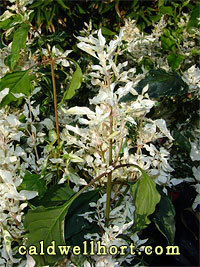 Info: Well branched shrub to about 4' produces 2" white highly fragrant flowers in summer. Repeats bloom under warm sunny conditions. Highly tolerant of alkaline soils unlike other tropical Gardenia varieties. Touted as being the most fragrant of all Gardenia species! 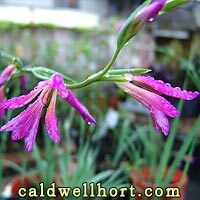 An old south cottage garden heirloom gladiolus with small vibrant magenta flowers grown in America since colonial days. These bulbs increase year after year into even larger clumps. Gladiolus byzantinus, sometimes known as cornflags, mark many old home sites and cemetery plots in Texas and the Southern U.S. These are beautiful plants, a true heirloom cotton with mauve pink flowers, dark burgundy leaves and it produces real cotton! The plant looks a bit like a burgundy leaf confederate rose. The cotton fibers are white. Plants are full bushy and about 18 inches tall. 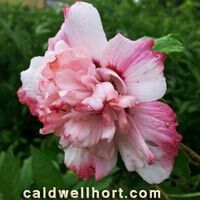 Cotton is a perennial Mallow and if protected through winter freezes will shine again next year in your garden. You can also start this heirloom burgundy cotton from its seeds. <-- Click Thumbnail for larger image! 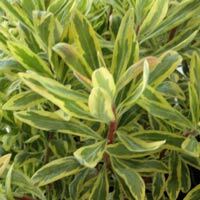 Foliage is oval shaped, glossy, variegated and leathery; leaves are up to 5 inches long. Likes medium humidity and moist not wet soil. Grows five to eight feet tall by two feet wide. Useful as a specimen or background planting. Will freeze but is root hardy to about 25 degrees. Fast growing. A large arching shrub with lavender starry flowers constantly. 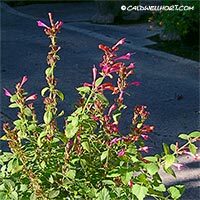 This very drought tolerant shrub is easy to grow, and cold hardy. Prefers full sun but can adjust to partial. Can be pruned to keep in bounds, otherwise can get about 5' tall. This shrub is also salt tolerant! 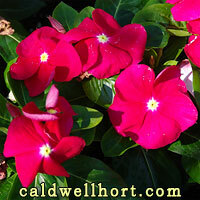 Easy to grow, good for hanging baskets, planters, or ground cover. Interesting chocolaty foliage marked by prominent green veins and purple beneath. Vivid red flowering Yucca. This is a just released variety! Clumping accent plant to 3-4 feet tall and wide. 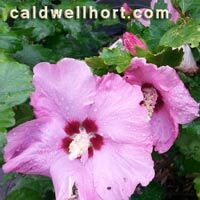 This native Texas hibiscus is a drought- tolerant shrubby perennial native to the Rio Grande Plains, Edwards Plateau and Eastern Trans-Pecos regions of Texas. Bright crimson flowers bloom from spring until fall. 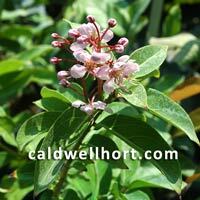 It is a deciduous shrub growing one to two feet tall and requiring good drainage and winter mulching in colder areas. 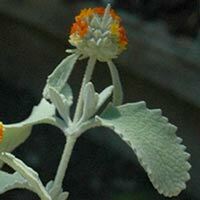 Can be grown in full sun or partial shade. 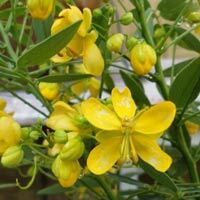 Summer bloomer, Will grow into a 4 ft tall and wide shrub, flowers cheery yellow. Rozelle plant. Small red fruits are pickled and the leaves used as a vegetable and spice in curries. 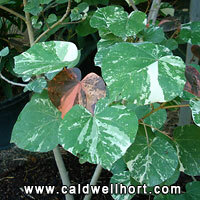 Striking foliage plant with splashed multi-shaded green and white leaves. New leaves are tinted deep maroon. Flowers are yellow with a dark maroon center. Neat variety from Brazil. 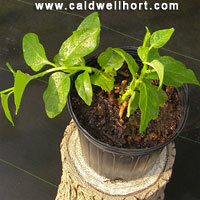 Fast multiplier and vigorous grower. 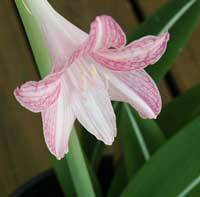 Blooms are pink, slightly ruffled, reticulated with deep cerise pink stripes. Leaves have prominent white stripe. Unique! Very ornamental woody vine, with very sweetly scented pinkish flowers with unusual red propellor like seed capsules, hardy and easy to grow! American Hosta Growers Association 2006 Hosta of the Year. Easy to grow, multiplies quickly. 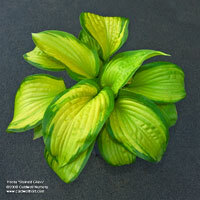 Stained Glass Hosta is more sun and heat tolerant than most Hostas and has bright shiny golden foliage with two inch wide dark green margins. 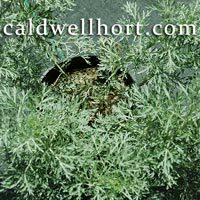 Plants grow into 3 to 4 foot wide clumps with large fragrant light lavender flowers in the fall. Clumps are easy to divide. 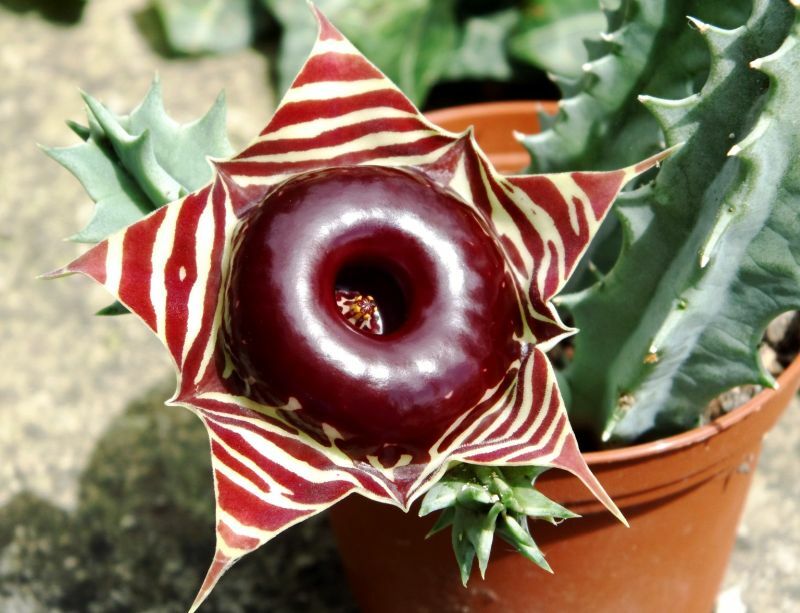 Succulent with 5 pointed yellow star shaped flowers banded in coppery brown with dark red life saver shaped rim. 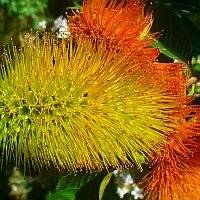 Unique and easy to grow! 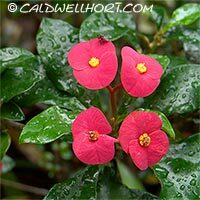 Native to Mexico, this member of the Euphorbia family loves hot dry weather. Treat as an annual in most of Texas as it will freeze if unprotected in winter. 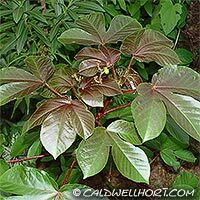 Once established, this fast growing shrub with , beautiful maroon shiny 3 to 5 lobed leaves and small red flowers will reseed itself and return each year with the onset of hot weather. 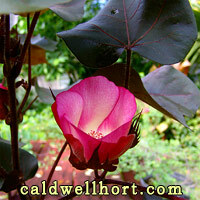 This tropical is easy to grow, just plant, water in, and forget. Blooming nearly year round during warm weather, Yellow Jacobinia grows 6 to 8 feet tall with clusters of yellow flowers at the ends of branches and large tropical looking leaves. Pinch spent blooms for neater appearance. Hardy to about 30 degrees. 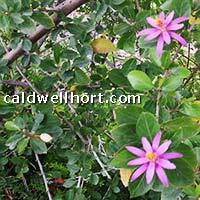 Hardy small shrub to 4 feet tall, rose pink flowers and purple undersides to the leaves. 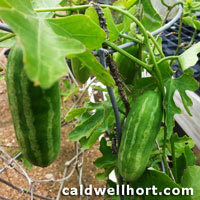 Grows well in shade in a good moist organic soil. 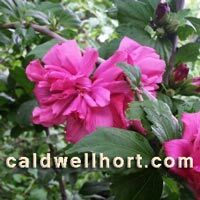 Blooms all summer with mounds of large rose-pink flowers. Easy to grow!